Pundits may be proclaiming that email is dead, but with everyone from Dropbox (bought an email startup) to Google (launched a new app) to Amazon (just launched a service) throwing money around it's clear that the tech is very much alive. A couple different email stories crossed my desk today. The first comes via Forbes and the WSJ, which report that Amazon is expanding on their other workplace services (WorkSpaces, Zocalo) with the launch of Amazon WorkMail. Amazon WorkMail is a combined email and calendar service which is intended to challenge Google, Microsoft, and other tech companies on yet another front. It's said to be a secure and simple to use email solution which works with existing mail and calendar tools (Outlook is mentioned, but not others). It's going to cost $4 a month per user for a 50GB inbox, and Amazon expects to sign up that it can deliver improvements and that companies will be satisfied with the experience. "Customers are not happy with their current email solution," Adam Selipsky, an executive with Amazon Web Services, told WSJ in an interview Wednesday. "A lot of customers feel those solutions are expensive and complex." Do you know what's not complex? 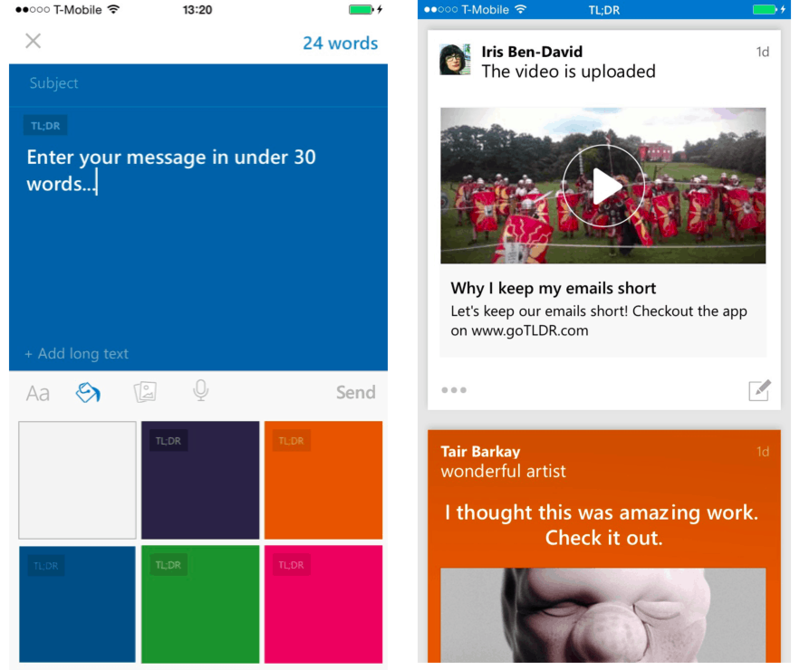 A new email app called TL;DR. This app is designed to let users send emails that are only 30 words long, or about as long as this one sentence. Techcrunch reports that users can also link to longer versions of their missives as well as other documents, and when they browse their inbox the emails are styled like status updates from social networks. The app is launching today, with Gmail integration. You can find it in iTunes and there's said to be a Chrome extension, although I can't find it. Apps for other platforms are coming soon. What TL;DR is offering as its unique selling point is brevity. Those who use the app are effectively forced into trying to think of how to distill their messages into fewer words, while those who are using other email programs will see their messages cut off at the 30-word mark. For those browsing their feeds, threads can be viewed effectively like messaging conversations. All in all this is a nifty idea, although it strikes me as redundant. This is basically a private social network based around email. It takes the idea of a tweet or Facebook update, makes it private, and offers users an archival copy in their inbox. Given that enforced brevity is already available via Twitter, I don't see what this app adds. Well, it could add to your frustrations when incoming emails are automatically cut off at 30 words (I'm sure the rest is hidden behind a more button and not actually deleted). But I don't see what positive aspects are added. I use both Dropbox’s Mailbox, and Google’s Inbox, and enjoy them both. Mailbox sometimes takes a while to connect, but that should improve. Although TL;DR sounds interesting, I can’t see myself using it. If I want to send someone (or a group) a short one-sentence email message, I’ll send it, from Gmail or Apple Mail or Mailbox. What’s the benefit of TL;DR? And as you’ve pointed out, Nate, for purely social messages, Twitter and et al do fine. Twitter et al isn’t just for social; I regularly get quick notes from people via Twitter DMs. And that includes people who have my email but use twitter because its more immediate.